Year 2018 will be an equally crucial year for the life insurance industry, as the first few private players will complete 18 years. Is the industry ready to take the burden of expectations which adulthood brings with it? Completion of 18 years is a major milestone in an individual’s life, stepping from adolescence to adulthood. Year 2018 will be an equally crucial year for life insurance industry, as the first few private players will complete 18 years. Is the industry ready to take the burden of expectations which adulthood brings with it? It had been tumultuous 18 years for Indian Life Insurance industry, but with a mature head on its shoulders and energy & optimism of youth, Indian life insurance industry is set for another eventful year. The good news is, that growth is back in life insurance industry and it is expected to grow at a rate of 15-18% during the next fiscal as per ICRA. Tailwinds of favorable macro economical changes have provided a firm ground to the industry and ended the period of turbulent times that started with global financial turmoil in 2008. A stable government with a clear majority in Lok Sabha and growing presence in Rajya Sabha augurs well for the economic agenda. The GDP growth is expected to cross 7% per annum next year. In addition, with inflation, disposable income is expected to rise. As per Karvy’s India Wealth Report, the wealth in financial assets held by individuals grew by 14.63% in FY17 and is expected to continue this trend over the next 5 years. With a population of over 1.34 billion, India’s life insurance penetration rate is still below 3% of GDP. Awareness about the true purpose of life insurance or long-term savings and protection instrument, is still quite low. As a result, neither are the Indian households fully protected from unforeseen disruption caused by the death of bread winner, nor are they equipped to adequately provide for longer term life stage goals such as retirement. The financial portfolio of most Indian households is highly fragmented without a clear focus. Indian life insurance industry will have to make a concerted effort towards increasing life insurance awareness so that people invest in life insurance for the right reasons and more importantly, stay invested in it over the long run. 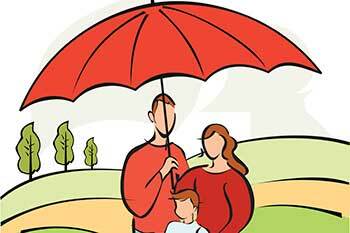 India offers growth opportunity to life insurance industry at both ends of age spectrum. On one hand, India’s millennial population is expected to cross 45 crore and on the other hand the elderly population will be over 10 crore by 2020. The gradual movement of India’s population to urban areas will continue and in few years around 40% of India’s population will be living in urban areas. Nuclear households that constitute 70% family structures now, is expected to touch 74% in 2018. This will offer life insurers a concentrated market of households who do not have the traditional security of joint family. Millennials will be become more important as they will play the role of key decision maker early in their life in nuclear households. As they are more open to share their data in the virtual world to get exactly what they are looking for, data analytics and insights curation will open some new opportunities for the industry. With higher risk taking ability and greater awareness of the need to hedge those risks in life, the demand for protection oriented financial products will witness further increase. While millennials may prefer the convenience of online purchase journey, a large set of Indian will still need the support of physical sellers. And between the two extremes will be those who will research online but prefer to buy offline. These multiple customer segments will touch several distribution channels in a single purchase journey making it imperative for life insurers to offer a seamless omni-channel experience. Expect a chatbot to be solving your problems as basic as suggesting a suitable plan or complex problems such as suggesting an investment decision based on your investment risk profile in the coming year. Human intervention will decrease and reliance on digital will increase with rapidly changing technology. Artificial intelligence (AI) based programmatic marketing will be customized to suit differently to each customer. It will be important to meet the customer’s demand for customized products. Speed will be of extreme importance. Your day to day wearables will broadcast data about your health which will allow the insurers to reach out to you with pre designed customized solutions. The possibility of instant issuance with no medical and financial under writing using IOT (Internet of Things) and AI based technologies will also go up many folds. However increased dependency on digital will also lead to more security risks. AI based phishing scams will become harder to catch and spurious calls might sound even more genuine with the info collected from customer’s social media assets. Insurers will have to work on improving IT system security and protect customer data. In the information age, ideas are the key differentiator. Customer information is available in abundance but what is going to be critical is to utilise that to create actionable insights. Data and analytics capabilities will assume even greater significance to reshape how life insurers connect, serve and engage with its existing customers. With a large set of existing customers and each customer having 5-6 life stage based opportunities to buy life insurance products, long term efforts towards customer loyalty will become critical for business success. A superior customer engagement effort will not only drive superior renewal book and cross sell opportunity for life insurers, it will significantly enhance customer returns as they will remain invested for longer tenure. If year 2017 was the year of IPOs with three life insurers going public, year 2018 could bring in a new set of players as PE investors could now be a new source of capital. The regulator’s willingness to allow private equity and venture capital investments in the industry may bring about change in ownership in life insurance industry and first time entrepreneurs may enter the market. This may well trigger the entry of ‘life insurance startups’ promoted by insurance professionals supported by PE and VC investors as promoters. This may create a new set of nimble footed and hungry players who will force the traditional life insurance companies to think new and different. There is no doubt that 2018 will see increased growth, more participation and superior product solutions. Life insurance industry has been waiting for such a period for long, which will eventually end up benefitting the customers. It is important that the insurers, regulators and government work in close coordination and leverage the immense possibilities that lie ahead specially in the light of the changes that are discussed above. Next year around the same time when the industry will be completing the first year of its adulthood, we will truly be on our way to the next phase of insurance industry’s growth.